The three of us were walking around St. H. town, when I thought of looking for something to upcycle. I was diving in and out of charity shops, bought a few old beaded necklaces… You know, so I could pull them apart and make other items of jewellery for my Treasures and Trinkets. Anyway, as we were nearing the car park, there was one final charity shop that I had not yet checked. I had a look around, and there they were, just sitting at the back of a shelf. No one had taken an interest for quite some time, as there was a layer of dust on them. There were two, fine bone china teacups and matching saucers. Excellent condition. They each had a rose on them, and said “Ruby Wedding” in a lovely font. I immediately pointed them out to M. “What do you think of these for my mum & dad?” M asked what I would do with them… I ummed, and ahhed, and I didn’t know. I looked at the price sticker… £1.50 for the set. How could I not? I mean, if I couldn’t think of anything to spruce them up, I would simply clean them and give them to my parents as they were. Then I had an idea… I bought a large “church” candle from Asda (£2). Several months went by, and that brings us up to yesterday. I asked M if he could remember where the teacups, and candle, were. After an hour or so of searching every nook and cranny of the garage and house, M found everything. 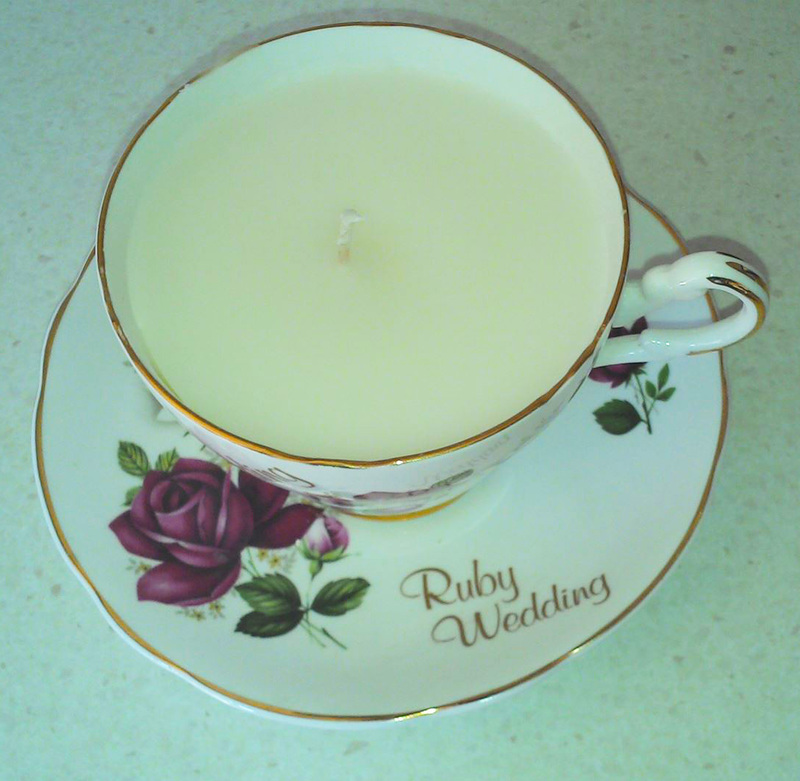 So, here’s how I managed to make teacup candles, with no experience what-so-ever. 1. First of all, you need to make sure that the glass bowl can ‘sit’ on top of the pan. When you have sorted that out, fill the pan with water. The bottom of the bowl should not touch the water at all. If it does, empty some water out. 2. Chop up your candle, being very careful not to cut the wick. You’ll need this for your teacup! 3. Put the chopped up wax in the glass bowl. Put the bowl on top of the pan of water, and heat on a medium-high temperature on your hob. 5. Straight back to your heating wax… Use the old chopstick to gently circle the melting wax. The trick I found here is not to let the wax boil. As I said, I had a large “church” candle, that measured approx 5 inches tall, by 6 inches circumference. It took about 25 minutes for this to completely melt. 6. When your wax has completely liquidated, add 1/2 teaspoon of your pure essential oil, and stir for a further minute. I chose lavender. 7. Turn off the heat, and pour the liquid in to your prepared teacup. Don’t worry if you knock the wick… Luckily, it won’t set immediately, so you can reposition it. 8. Put the bowl back on the pan. Make sure the heat is off. 9. Here’s the boring bit. After about 30 minutes, the candle will have gained a “skin”. You need to pierce the skin, using the wooden toothpick. Don’t be afraid… Push it in, nice and deep, somewhere near (but not touching) the wick. 10. After a further 30 minutes, or so, you will need to pierce the “skin” again. Choose the opposite side to pierce this time. 11. That’s it. Leave your candle to dry out overnight, and leave your leftover wax (still in the glass bowl over the pan of water) where it is. You’ll need that again in the morning. 12. *yawn* After not sleeping, through sheer excitement because of your amazing talents on making a teacup candle, it’s time for the final part. 13. You will find that your candle has “sunk” in the middle, around the wick. Don’t worry if this has happened. It just means that there was an air bubble that popped and settled after you pierced it last night. 14. Reheat your wax – good job you left the equipment out, eh? 15. Simply top up your candle with the melted wax. Don’t get carried away here. You shouldn’t be filling up the teacup, simply topping up the well that has appeared, with a little extra to cover the rest of the candle. If you’re planning on burning your newly made talent, don’t light it until at least 24 hours after you have completed the process. That will give it time to settle (, and prepare itself for you melting it again!). That’s actually so cute and simple! I must try this for my next garden party. I saw a paper tutorial of making paper teacups, might see if I can wax dip the whole thing then add the candle to make the whole thing disposable and homemade (chuck it one the BBQ when the night is over).